I adore the smell of the tomato vine when you walk through the stalls at the farmers' market. Like a summer rain storm, I can smell the tomatoes long before I see them. When I was a kid, my brother and I loved to scour our mother's garden, looking for green-horned tomato worms. 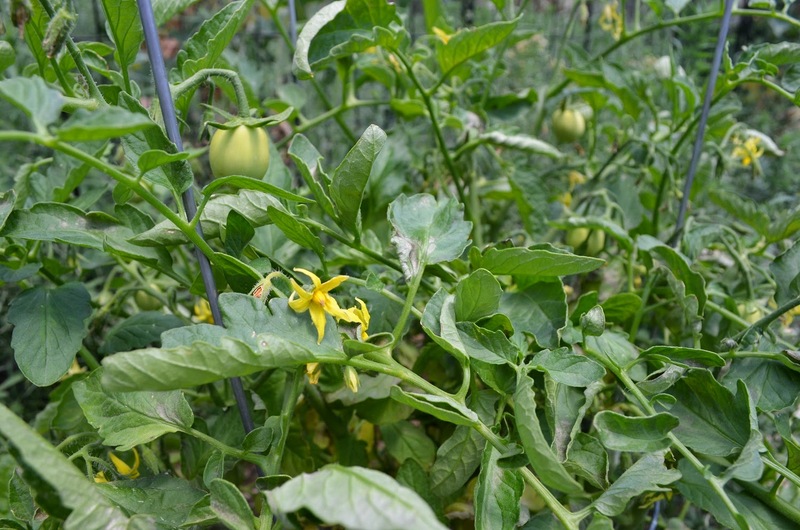 We'd hunt through the tomato plants first thing in the morning while it was still cool and the plump caterpillars were inching their way through the green tomatoes. Thinking we were saving them from certain doom, we'd collect them in old glass pickle jars, adding sand and sticks and fuzzy tomato leaves for them to munch on. You see, after the breakfast dishes were washed, my mother would put on her sun hat and go out to the garden, and if she found a green-horned tomato worm feasting on her plants, she'd certainly smash it. Heroically, we'd pull the worms from the vines, and place them safely in their new homes. In protest the worms would spit-up on us, a sticky green mess that smelled of tomato vine. By lunchtime we'd smell like tomatoes from head to toe. Okay, not a very appetizing memory, I have to admit. But the point is that just the smell of tomatoes on the vine brings me right back to these moments as a child in the garden. Tomatoes are everywhere these days, and I can't help but buy them every chance I get. The kids eat them like apples, juice running down their chins, and I've been known to add them to just about anything. Someone once said: Knowledge is knowing a tomato is a fruit. Wisdom is adding it to your fruit salad. Well, I haven't yet added them to a fruit salad (it's coming), but I did make a pie with them last weekend. This Caprese pie is everything we love about Caprese salad, baked into a tender crust. Finished with a sweet drizzle of balsamic sauce, I can almost imagine I'm back in that garden. The tomatoes are ripe, and there's not a sticky, green worm to be found. Mix together the water and vinegar and place in the freezer to keep it cold until ready to use. Mix together the flour, sugar and salt. Using a pastry blender, cut the butter into the flour until the mixture is coarse like wet sand. Mix in the water/vinegar mixture a little at a time until the dough just sticks together. (Depending on the humidity in the air, you may not need to use all the water.) Knead the dough a few times and form into a disk. Wrap in plastic wrap and refrigerate for 45 minutes or until ready to use. Preheat your oven to 425 F (220 C) and butter a 9 inch pie plate. Slice the tomatoes 1/4 inch thick. Layer the slices in a colander and sprinkle with salt. Place in the sink to drain for 15 minutes. While the tomatoes are draining, roll out your chilled dough to about 2 inches larger than your pie plate. Carefully transfer to the buttered pie dish and press into the bottom of the pan. Trim away the excess dough. 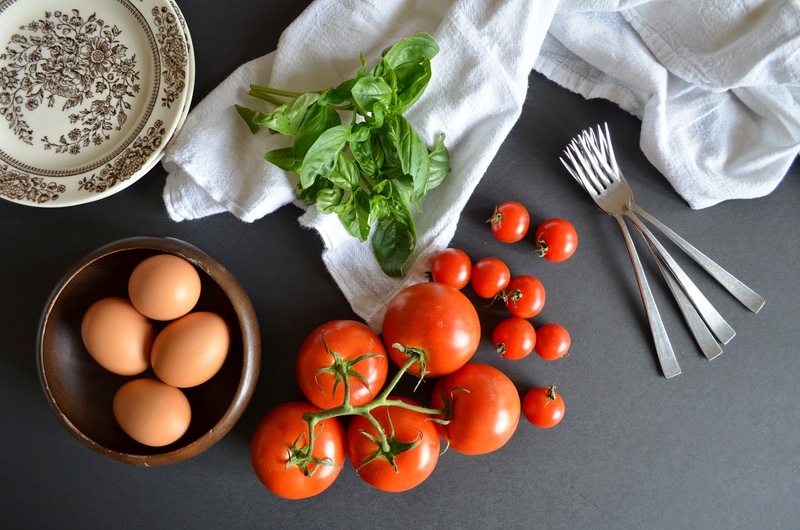 Separate one egg, placing the yolk into a large bowl and the white in a small bowl. Beat the white until just frothy. Brush a thin layer over the bottom of the crust and place the crust back in the refrigerator to chill for approx. 20 minutes longer. Meanwhile crack the remaining eggs into the bowl with the yolk. Add the milk and salt and pepper to taste and whisk. Drain the tomatoes on paper towels. Pour the eggs into the bottom of the chilled crust. Top with the mozzarella cheese. Arrange the tomatoes neatly on top. Drizzle a little olive oil over top and brush the outer crust with the remaining egg white. Bake the pie at 425 for 15 minutes. Reduce the heat to 350 F (175 C) and continue baking for 25 - 30 minutes. Until the egg are set in the middle and the crust is a rich, golden brown. Garnish with fresh basil leaves. Serve warm or at room temperature. Drizzle each individual slice with balsamic reduction. Stir the vinegar and honey together in a small saucepan. Bring to a simmer, reduce heat to med-low and simmer for 10 minutes or until reduced by half. 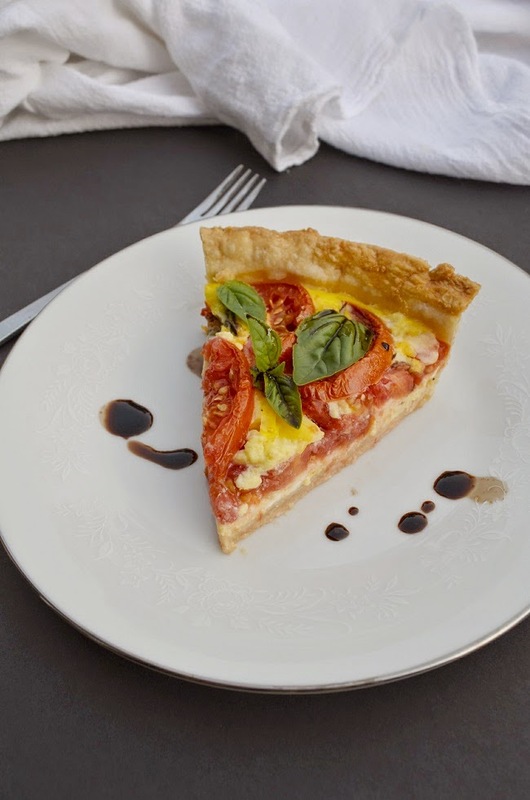 Drizzle over Caprese pie before serving. 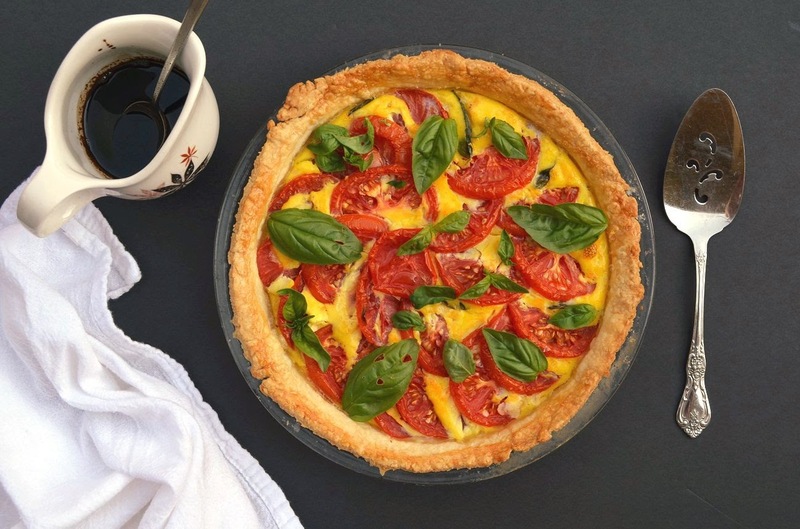 Looking for more ways to use tomatoes this summer? Check out this Marinated Tomato Salad. A summertime favourite.